Brazilian documentary filmmaker João Moreira Salles looks back at the year 1968 where everything seemed possible. He concentrates on four different events and places - Cultural Revolution in China, the student uprising/general strike across France, Soviet Invasion of Prague and March of the One Hundred Thousands against military regime in Brazil, all in that fateful year. 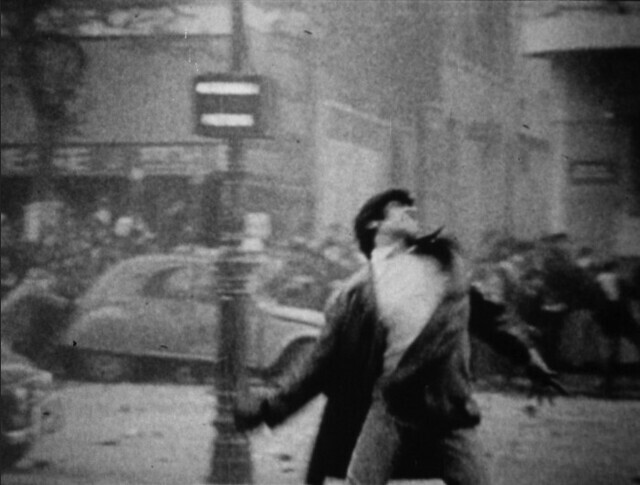 Culling from images of homemade movies, newsreels and documentaries, Salles examines what it's like to take it to the street for something you believe in in that fateful year. It starts out with the tourist footage in China in 1966. Salles' mother was there, taking in a foreign land where everything was opposite of what she was accustomed to. As many picturesque scenes play out - farmers, children, on-lookers, other tourists in the sunny, happy settings, Mao Zedong's China in the beginning of Cultural Revolution seemed like an idealist utopia (except for incessant insistence on singing of songs praising the Chairman) that gloomy French students only dreamed of in the streets of cities across France in 1968. In his mom's words, the trip to China gave her "ineffable emotion that follows the shock of the unlooked-for encounter." This seeming spontaneity, unfettered enthusiasm are the themes Salles visits again and again when he talks of taking it to the streets. The May 68 first started as demonstrating students occupying college administration buildings. I do not want to generalize this nation-wide civil unrest or make light of it, but the gist of it was this: their opposition of American Imperialism in Indo-China and traditional social hierarchy with their Marxist, Maoist ideology struck a core with the factory workers, resulting in a largest general strike in France's history. School administrations and police's violent reaction just inflamed the situation even further. Armed with wealth of footage around that time, Salles examines the short-lived unity forged between students and striking workers against the status quo of de Gaulle regime and how quickly it dissipated. He spends quite a substantial time on Daniel Cohn Bendit, who was one of the key figures in the student movement. Through several interviews and Salles' voice-overs, we get the impression that the decentralized student movement of 68 didn't actually have an end goal. And his road trip to Berlin accompanied by a photographer and funded by a magazine was seen as a sell-out. Even one of the famous slogans on the wall, 'Sous les pavés, la plage'/'under the bricks, a beach' can be read as extremely bourgeois. But does it matter though when you talk about the spirit of 68? You believed in something so strong you had to take it to the street. These protests weren't without casualty though. Gilles Tautin, an 18 year old High School student died near car factory. The self-immolation of Jan Palach to protest Soviet occupation in Prague put the nation in moaning. Then there was Edson Luís who as shot to death by the police in Brazil. The footage that stands out is a young woman factory worker interviewed by the news crew outside a car factory. She is crying and refuses to go back. She protests that nothing has changed, that everything is going back to status quo. The factory management made some concessions but the thought of revolution showed a glimpse of a more just world. As the history that unfolded after that period, we know that Mao might have succeeded in building a cult for himself and solidified his political power with Cultural Revolution, but it also did irreparable damage and brought misery and death to millions of people. de Gaulle regime's grip got stronger and Communist and Socialist party lost support. The smell of teargas and horse manure in the air, a street protest can be an exhilarating experience. A full-on revolution might not be possible in our heavily capitalist conditioned society, and we put too much emphasis on ends over means, failure over efforts. Neither Salles glorifies the May 68 nor dismisses it as naive. He doesn't spoon-feed the audience. What Salles is showing with his documentary is that a shock to the system, albeit minuscule in the grand scheme of things (May 68' movement didn't even last 6 months), is a necessity to keep the world in check. The legacy of 68 is that it made people 'woke'. Its impact still felt from Occupy Movement to more recent the Black Lives Matter and #metoo movements. Anyone who took to the street for one cause or another can deeply relate to In the Intense Now. With the disparity between haves and have-nots is greater than ever, the spirit of 68 is more relevant than ever before.